Volvic’s commercial, “The Giant”, also known as “La Force du Volcan” (The Strength of the Volcano), has won Gold for special effects and computer graphics at the Cresta Awards. The commercial, released in October 2014, was designed as an aesthetic and powerful evocation of the evolution of Planet Earth, from explosive beginnings to the present day, the story of the immortal strength of the volcano and its treasure, the water of Volvic. 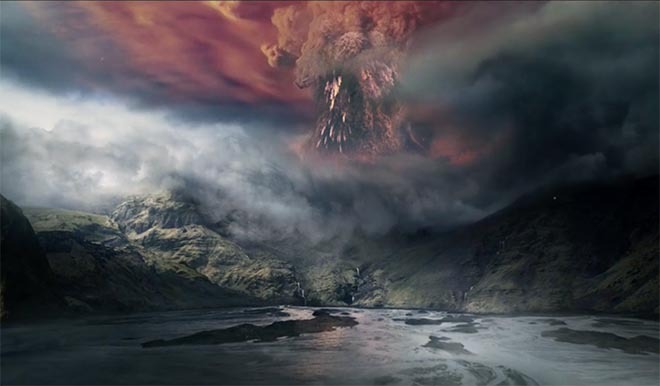 CGI reproduction of volcanic action, historic moments and creatures such as pterodactyls, is intertwined with footage shot in Iceland. The Volvic Power of the Volcano campaign was developed at Y&R Paris by creative director Pierrette Diaz, art directors Jerome Billet and Xavier Reye, designer Matthieu Vivinis, agency producers Valerie Montiel and Estelle Diot. Filming was shot by director Johnny Green via Gang Films with director of photography Joost Van Gelder, producers Jean Villiers and Nathalie le Caer, production designer Pirra, line producer Rodolphe Lanaro, costume designer Olivier Beriot. Production in Iceland was by TrueNorth. Editors were Walter Mauriot and Fred Baudet. Visual effects were produced at Digital District by head of post Peggy Tavenne, VFX artist Julien Fabbris, 3D VFX artist Thomas Brand, VFX producer David Danesi, VFX shoot supervisor/tracking artist Pierre Pilard, Flame artist/compositor Bruno Maillard, matt painters Xavier Reye and Fabien Roumazeilles, 3D lead/animator Romuald Caudroit, lead texture artist Laurent Guarin, modeller Kevin Monthureux, modeller Jimmy Cavé, renderer Nicolas Belin, producers Jean-Marie Ravot, François Schmidt and Lolet Ong. Sound was produced at 750mph and Y&R Paris studio The Shop by Sam Ashwell, Matthieu Devos and Vincent Nayrolles. Music, “Iron” by Woodkid, was supervised through The Shop.